Avocado is a great choice for baby's first food. Actually, it's a great choice for anyone to eat, but it's an especially great choice for babies. Avocados are chock-full of nutrition, including protein, essential vitamins and minerals, and even good fat to help your baby's brain. (Did you know brains need fat to work properly? Fun fact!) Plus avocados are delicious, so let's not forget that fact either. So how exactly do you choose the best avocado for your baby? It's not a baby food that comes in a jar, unfortunately, so it will be best to actually choose a fresh avocado from the store. If you are unfamiliar with selecting a good avocado, rest assured it's a fairly simple selection process. If you want to purchase your avocado ripe and ready to eat, look for one that has a bumpy skin in a dark green shade. When you gently squeeze the avocado, it should be firm but give just a little under the pressure. Rock hard avocados are not yet ripe, and ones that feel extremely soft are overripe. To check quickly if an avocado is ripe, look around the stem of the fruit. A yellow color indicates that the fruit is ripe, while brown means it's probably overripe and brown inside as well. When you prepare the avocado for your baby, you'll notice that when you cut the ripe avocado in half the inside flesh is green that goes to a butter yellow toward the pit. This is a good indication that you've selected a perfect avocado. If you'd rather allow your avocados ripen at home, you can hasten the process by placing them in a brown paper bag - just don't place them in the refrigerator when they are not ripe. Check regularly for ripeness. It's really that simple. Once you have found that perfectly ripe avocado for your baby, you can simply cut the avocado in half, pull out the large pit in the middle, then scoop the green fruit of the avocado out into a bowl. 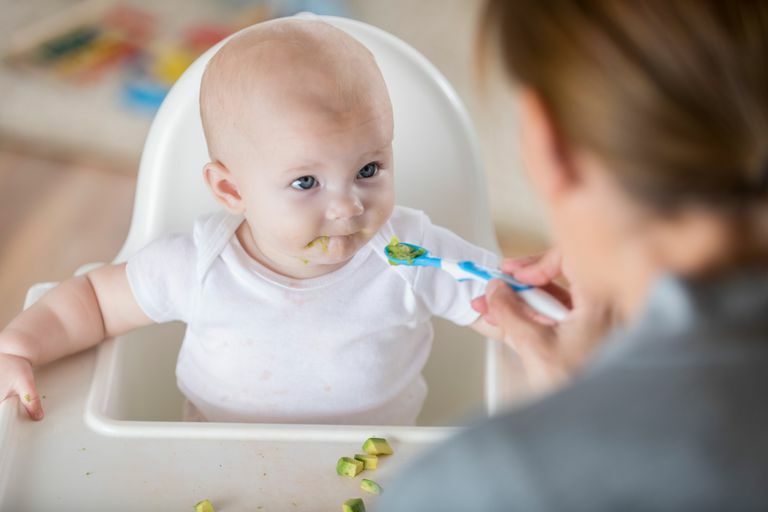 If your baby can handle chunky solids, you can simply mash the avocado with a fork. Otherwise, you'll want to use a food processor to make sure the fruit gets nice and smooth. If your baby doesn't eat all the avocado and you would like to keep it fresh, press plastic wrap closely to the skin of the avocado and store the rest in the fridge for up to one day. Avocados go bad very quickly, so you'll have to act fast. Is Your Family Ready to Start a Health and Fitness Challenge? Are Fats Really the Nutritional Bad Guys?